The story of tea «Maitre» has its roots in the distant XIX century. The tea in France, after two centuries since the first serious love with this drink was already quite widespread. Thanks to the fashionable tea salon and tea dance evenings, tea has become especially popular with the French. Seaside resorts with their casinos, verandas tempted flowers, grand hotels such as the Grand Palace in Biarritz, provide an excellent opportunity to enjoy a leisurely cup of tea while enjoying a pleasant conversation. Not far from Paris, in the Bois de Boulogne, it was possible under the shade of trees to book a table for tea, to which visitors can drive right in the carriage. The French take tea as seriously as wine. There is particular interest to rare and exotic teas grown on certain plantations. It is in tea-houses of France for the first time in Europe there appeared professionals who will help visitors choose a tea with a certain flavor characteristics and properties, and also pick up some dessert to them. Especially was appreciated the ability to brew, to serve and serve tea. Now is becoming fashionable to call specialists of tea “sommelier”, follow analogy with wine professionals that understand wines and their serving. During its history the French tea houses have created and developed a sophisticated and beautiful art selection and tea, which today combines leisurely immutability of East and refined French approach to the choice of drinks. Tea «Maitre» - is the embodiment of refined French approach to tea. 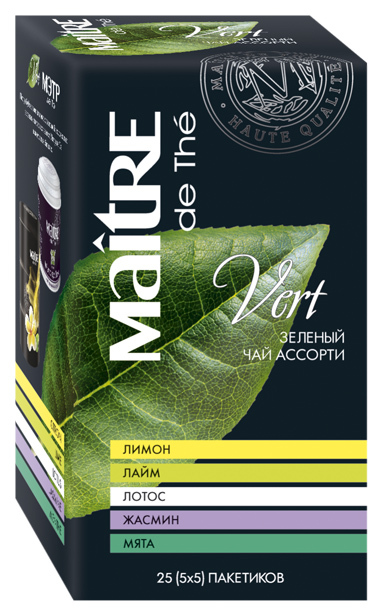 Leading tea sommelier of the tea clubs from Paris participated in the development of unique blends of black and green tea for collections Noir and Vert, and the collection of the Mate added exotic and diversity in a wide range of teas. 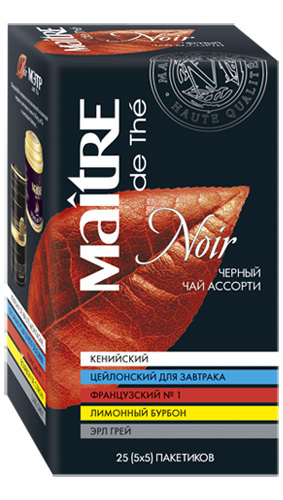 Tea «Maitre» not accidentally appeared on the market. Desire to enjoy really good tea constantly exists in every connoisseur of this drink. But many of the advantages of tea appear only if a number of important rules are accomplished, such as the right choice and treatment of the water, following the process of brewing... Sometimes you can miss the chance to recognize suitable tea just because it did not properly prepared. 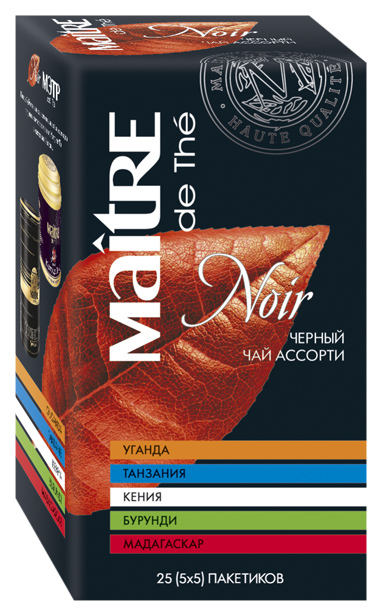 That is why the "Maitre", as a true tea sommelier gives you in a simple and accessible form the secrets of the selection and preparation tea. You can find out what kind of tea is especially recommended for a particular situation or time of the day, how to make it, to get the most out of taste and useful properties of the tea, and even when, and with whom it is recommended to drink. Born in the new millennium our product combines tea traditions with the pursuit of innovation and progress. 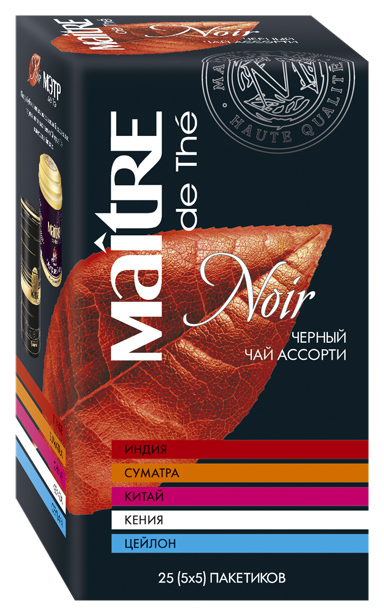 Our range of high quality gourmet tea offers an enormous amount of choice and opens door to whole world of flavors. The variety of tastes and flavors is endless and trying them is a voyage of discovery. Of course our best known products are collection of different assorted tea in sachets. 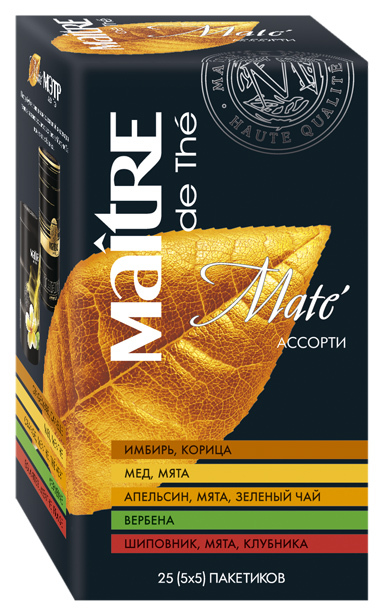 In these products we combine choice of the best tea from all around the world with advanced design and flavors. For tea lovers we offer a collection of exclusive teas in metal tins. Our team of tea buyers and tea tasters spend lot of time visiting tea gardens and factories around the world. Through tireless exploration and expertise we have opened door to the vast world of specialty tea. 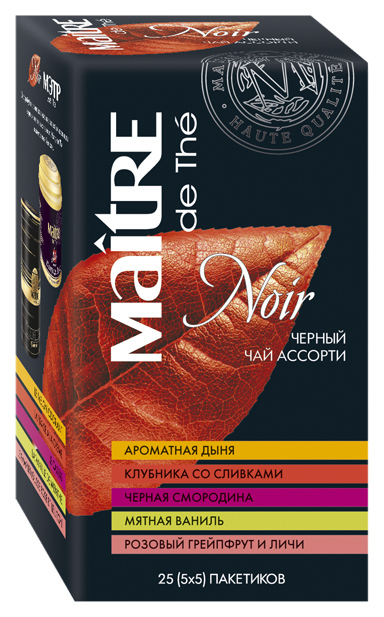 It is worth to mention our collection of teas for gifts, the design of which developed by the best designers. They are small masterpieces outside combined with unique tea composition inside. Green tea from different provinces of China:Dao-cha, Long-cha, Ansi-cha, Sen-cha, Mao-cha. Barcode:... Readmore . Green tea with lemon, lime, lotus, jasmine and mint. Barcode: 4607099090118 Readmore . Green tea with vanilla caramel, lotus and rose, hibiscus, aspberries and strawberries. Barcode: 4607099090408... Readmore . Five kinds of black tea: Kenyan, Ceylon breakfast, French № 1, Lemon bourbon, Earl Grey. Barcode:... Readmore . Black tea from five countries: India, Sumatra, China, Kenya and Sri Lanka. Barcode: 4607099091443... Readmore . Black tea from five countries of Africa: Uganda, Tanzania, Kenya, Burundi and Madagascar. Barcode:... Readmore . Five kinds of black tea: flavorful melons, strawberries with cream, black currant, vanilla mint, pink... Readmore . Collection of five different tea-beverages: cranberry - cloudberry, wild strawberry - stone bramble,... Readmore . Assorted Mate-bags in carton boxes: ginger-cinnamon, honey-mint, orange-mint-green tea, verbena, rosehip-mint-strawberry. Barcode:... Readmore . 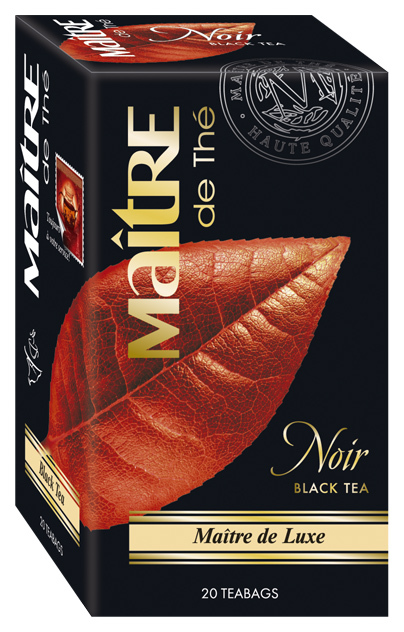 Blend of best Indian and Ceylon teas, made like black leaf tea Maitre de Luxe, in a new exclusive pack... Readmore .